Wealth is a crucially important measure of economic health. Wealth allows families to transfer income earned in the past to meet spending demands in the future, such as by building up savings to finance a child’s college education. Wealth also provides a buffer of economic security against periods of unemployment, or risk-taking, like starting a business. And wealth is needed to finance a comfortable retirement or provide an inheritance to children. In order to construct wealth, a number of building blocks are required. Steady well-paid employment during one’s working life is important, as it allows for a decent standard of living plus the ability to save. Also, access to well-functioning financial markets that provide a healthy rate of return on savings without undue risks is crucial. Overall, housing equity makes up about two-thirds of all wealth for the typical (median) household. In short, for median families, the racial wealth gap is primarily a housing wealth gap. This is no accident. Besides facing discrimination in employment and wage-setting, for generations even those African-American families that did manage to earn decent incomes were barred from accessing the most important financial market for typical families: the housing market. Housing policies that prevented blacks from acquiring land, created redlining and restrictive covenants, and encouraged lending discrimination reinforced the racial wealth gap for decades. Richard Rothstein’s forthcoming book The Color of Law documents exactly how such policies at all levels of government robbed black families and communities of wealth. Even as much de jure discrimination in housing was dismantled by public policy, de facto segregation and the legacy of wealth non-accumulation kept the racial wealth gap from closing. During the housing bubble that was the disastrous run-up to the Great Recession, the exposure to predatory, high-interest, and high-leverage mortgages led to an absolute wealth disaster for African-American families when the bubble burst. In the aftermath of the bubble’s burst, black unemployment rates rose to levels twice as high as white unemployment, leading to higher rates of delinquency and foreclosure for black families. And the sluggish recovery has only made matters worse, as home values recover at different rates across racial lines. The role of policy in creating and maintaining the racial wealth gap makes it clear just how difficult it will be to close the gap through the individual choices and behaviors of African-Americans. Educational attainment, the right occupation, and full-time employment are necessary, but not sufficient conditions for building wealth (and even equalizing these between races would be nothing short of miraculous). The typical black family with a head of household working full time has less wealth than the typical white family whose head of household is unemployed. This outcome holds for black families regardless of the time and money spent on educational upgrading. 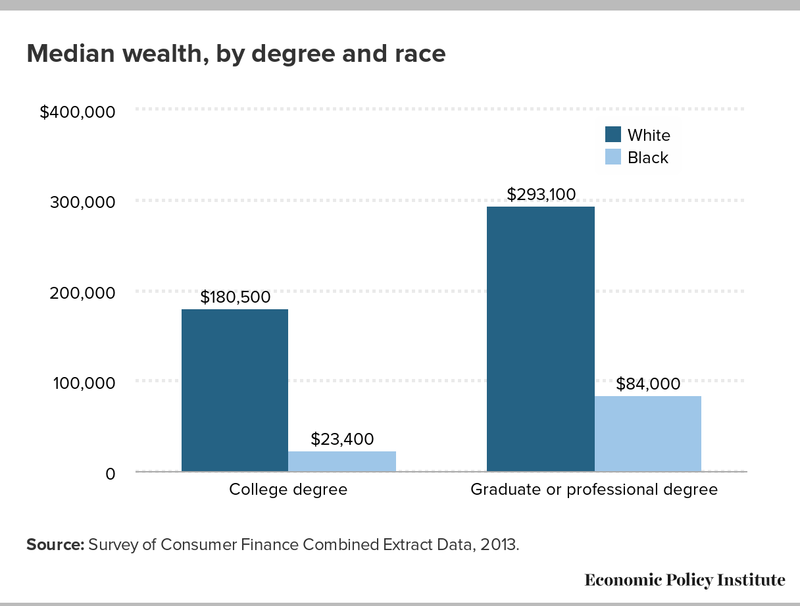 Median wealth for black families whose head has a college degree, for example, has only one-eighth the wealth of the median white family whose head has a college degree. Even the typical black family with a graduate or professional degree had more than $200,000 less wealth than a comparable white family. This is not surprising given that my previous research with John Schmitt has found a college degree really is no guarantee. Malign social policy has created and maintained the racial wealth gap, and only a progressive reorientation of this policy can close it. 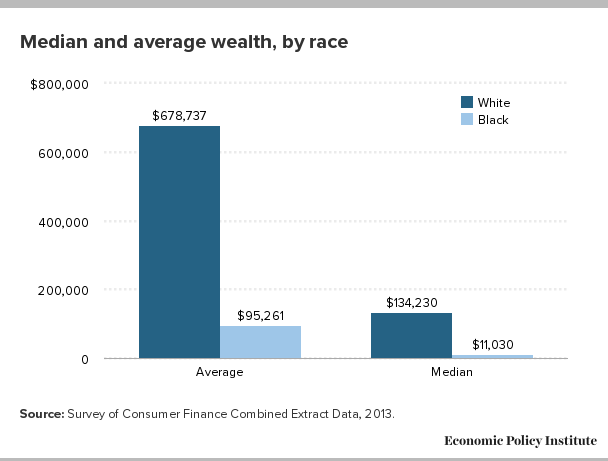 In an upcoming post, I will look at ways to close, or at least shrink, the growing disparity in wealth between blacks and whites.